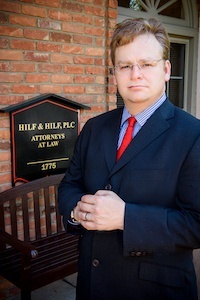 Hilf & Hilf, PLC attorney Daniel Hilf has a well known reputation in Wayne County for providing zealous legal representation in Detroit for persons charged with misdemeanor offenses by the city of Detroit attorney, Wayne County Prosecutor's Office, the Michigan Attorney General's office, or the Federal government. Criminal offenses have a huge personal toll, upon conviction which costs individuals their brightest possible futures. When you are arrested or receive notice of a new criminal charge against you, it becomes extremely urgent to receive no nonsense legal advice and zealous legal representation from a top rated criminal defense lawyer in order to put your legal troubles behind you. Misdemeanors in Michigan are criminal offenses for violations of local ordinance laws, some State of Michigan laws, and some Federal laws which are considered lower in severity than felony offenses. Typically charged misdemeanor offenses include (but are not limited to): retail fraud, domestic violence, DNR violations, assault and battery, aggravated assault, driving while license suspended (DWLS), drunk driving (OUI, DUI), disorderly person, hindering police, and reckless driving. For Detroit misdemeanor offenses, Court proceedings are scheduled at the 36th District Court for State and ordinance violations, and in Federal Court for federal charges. For State law felony and "high court misdemeanors", cases start at the 36th District Court and continue only to the Frank Murphy Hall of Justice if probable cause is determined. For most misdemeanor offenses that are prosecuted in the State of Michigan the maximum allowable penalty from the Court is a sentence of anywhere from 90 days in jail to 365 days in jail. The only exception to this sentencing range are "high court misdemeanors", which carry up to 2 years in prison as a maximum possible sentence (however, the penalty can even be higher if habitual offender sentencing provisions apply). In addition to potentially being taken into custody for a period of time, a misdemeanor conviction also gives the Judge sentencing you the discretion to order a probationary term, which is a form of supervision that is ordered by the Court to monitor persons on probation to make sure they exactly comply with what the Judge ordered. Probation can include a wide plethora of mandatory conditions and hoops to jump through that can make your life very difficult, including: reporting to a probation officer; alcohol testing (breath and/or urine); drug testing; no going to bars or places alcohol is primarily sold (liquor stores); payment of fines/costs/restitution/fees; professional counseling (substance abuse, anger management, mental health, domestic violence, etc. ); attend programs; take prescribed mental health medicines; prohibition on taking some legally prescribed medications (opiates, medical marijuana, etc. ); perform many hours of community service; no contact with victims, co-Defendants, or other individuals; inability of returning to certain locations (including your home if the victim lives there); tether, etc. Failure to follow all probationary conditions to the letter will likely lead to a probation violation hearing in front of the Court, which can lead to incarceration at the discretion of your Judge. There are charge specific consequences for misdemeanor convictions that can result in personal hardships, including: loss and/or restrictions to your ability to drive a car (all drinking and driving convictions, Driving While License Suspended, reckless driving, etc. ); loss of hunting and fishing privileges (certain Department of Natural Resources violations); loss of ability to work in a hospital setting to care for patients (various assaultive, drug related, and theft related crimes); loss of ability to lawfully posses and/or purchase firearms (domestic violence, stalking), etc. A misdemeanor conviction can lead to very serious immigration problems for foreign visa holders, green card holders, foreign students, and other persons who are not United States citizens, which (depending upon the circumstances) may lead to deportation, inadmissibility (inability to lawfully return to the United States if you depart), immigration detention, and the inability to seek certain forms of waivers and immigration relief. With a few exceptions in Michigan, misdemeanor criminal charges will force the Defendant to personally appear at the District Court to address the charge or charges with a magistrate or Judge. There are two possible exceptions to this rule: persons that are incarcerated in another State or county, who sometimes have the ability to resolve the case by means of sending the Court a "plea by mail" depending upon the local Court policies and the offense involved; some (not all) Courts allow certain low level misdemeanors called "payable misdemeanors" to be resolved by the full payment of fines/costs. An arraignment is the first Court appearance for many persons issued tickets, notices, or who are arrested. The arraignment is a court proceeding held before a magistrate or Judge where you are informed of the charge against you, advised of the maximum possible penalty the Judge can imposed if convicted of the same, and have a bond amount set. There is no rule as to the amount of bond the magistrate or Judge will approve; the bond amount can range anywhere from not needing to pay money with the Court (personal bond) to having to post a significantly large amount of money to secure your release from custody. The bond is determined by the Judge or magistrate after hearing from you and your lawyer, and considering whether or not you pose a risk of danger to others in the community and whether or not you will appear for all future court dates. The Judge can place strictly enforced and monitored conditions on your bond that are quite similar to being on probation with the Court ( drug testing, alcohol testing, tether (GPS or alcohol), no contact, etc. ), and place you in jail if you do not follow all of the bond conditions. It goes without saying that you should immediately engage a misdemeanor defense lawyer's services as early as possible to fully defend you. The criminal defense attorney in many instances is able to skip (waive) the arraignment and proceed to a pretrial (depending upon the Judge assigned, the severity of the accusation you are facing, your prior criminal history, and if a bench warrant was already entered), and help you obtain from the Court a reasonable bond amount and reasonable bond conditions. For most misdemeanors (not including "high court misdemeanors") a pretrial conference is scheduled within weeks of the originally scheduled arraignment date. "High court misdemeanors" are handled by the District Court Judge exactly in the same procedural manner as felony cases. For State of Michigan prosecuted cases that allegedly arise in Detroit, the 36th District Court proceedings (the probable cause conference and the preliminary exam) determine if the case is transferred ("bound over") for final resolution to the Frank Murphy Hall of Justice (if a probable cause determination is made at the 36th District Court). At the pretrial conference, the Defendant (with help from his or her lawyer) will make one of the three following choices: to resolve the charge by a plea and/or plea bargain; to set the case for a trial (jury or bench); to seek an adjournment of the pretrial to have more time to prepare and to address any relevant legal issues. due process Constitutional rights (presumption of innocence, prosecution has burden of proof of beyond a reasonable doubt, to have a jury trial (or to have a bench trial if the Judge, prosecution, and you all agree), right to cross examine all witnesses, right to subpoena witnesses to present for your own defense, right to remain silent, right to testify; any applicable appellate rights). If a conviction occurs based on a verdict rendered by your jury or due to entering a plea (guilty or no contest), it becomes up to the presiding Judge to decide on the terms and conditions of your sentence. You and your lawyer are given a full opportunity to say to the Judge anything you want to try and convince the Judge to be both merciful and lenient when deciding upon your sentence. Your defense only has high value and meaning if you have aggressive and experienced misdemeanor legal counsel to help you exercise all your trial and due process rights, because your defense is only as strong as its weakest link. You can choose go the public defender route if you claim you do not have any money, but it is often true in life that you get exactly what you pay for. Be cautioned - the Judge may also order you to reimburse the Court for the expense of your public defender. Does the legal representation who I am considering as my misdemeanor defense attorney make payment arrangements to help me afford the lawyer's services, or accept credit card and debit card payments?. When it comes to your consideration of attorney Daniel Hilf as your best legal option, the answer to the above questions is an enthusiastic "yes". You do not need to settle for a so so lawyer, an unprepared lawyer, or a lawyer who does not take the time or make the effort to properly defend you. You deserve an awesome defense. Well prepared, zealousness, sharp witted, being on top of his game, trustworthiness, client loyalty, persuasive, intelligent, and experienced are key descriptive terms that each apply to attorney Daniel Hilf. Although results are never guaranteed, because of the differences and uniqueness of everyone's legal circumstances and background, attorney Daniel Hilf's obligation if retained is to help you obtain the best possible outcome taking everything into consideration. If you are in a position where you have to go to the 36th District Court in Detroit or the Frank Murphy Hall of Justice in Detroit for a criminal accusation, the time is now to contact us.